Twelve years after its first flight, a F-35 Joint Strike Fighter finally crashed last week. The aircraft, a Marine Corps F-35B variant, went down in South Carolina near a key F-35 base. The incident overshadowed another F-35 milestone that took place the same day, the first takeoffs and landing of the F-35 from the United Kingdom’s newest carrier HMS Queen Elizabeth. Here’s all we know so far. Thankfully, there were no deaths or injuries in the incident which saw the pilot eject to safety. The crash took place on Friday at 11:45 a.m. Eastern Standard Time. According to Military.com, the aircraft crashed on Little Barnwell Island just outside Marine Corps Air Station Beaufort in South Carolina. The cause of the crash is unknown and remains under investigation at this time. The small, largely uninhabited island is located two miles northeast of Beaufort, a major East Coast hub for Navy and Marine Corps fighter jets. The Marine pilot ejected, was evaluated by medical personnel, and released. These particles should fully dissipate over the next few days. Although the risk of exposure is low, children and the elderly as well as those with compromised immune systems may have a higher risk of experiencing symptoms. Inhaling carbon fibers may cause breathing difficulties and symptoms similar to the common cold. If you think you are experiencing symptoms, please immediately seek medical attention. Despite the considerable amount of negative press the F-35 has received over its long development cycle—massive cost overruns, performance issues, alleged design flaws and its status as a flying example of the military-industrial complex run amok—Friday’s crash is the first in the history of the entire program. 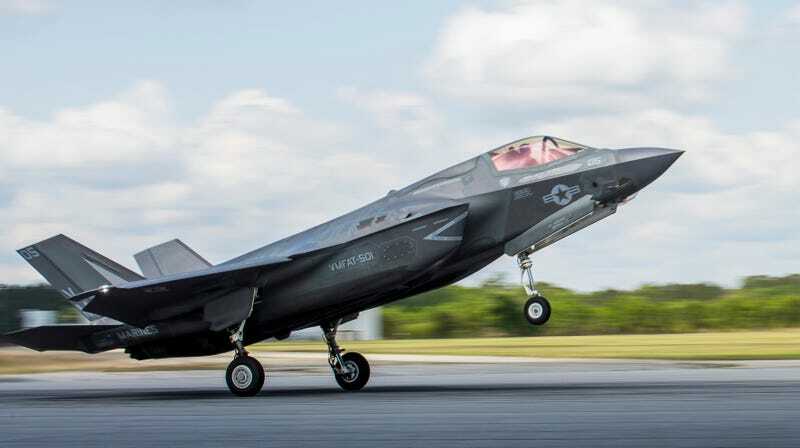 The F-35 first flew in 2006 and as of June 2018 all 300 belonging to the United States and its allies had racked up more than 140,000 crash-free flight hours. As Foxtrot Alpha pointed out last month, despite all the delays, shortfalls, and budget issues, the F-35’s safety record has been remarkably good. The Marines plan to purchase 420 F-35s, 353 of the -B variant and 67 of the U.S. Navy’s -C variant. So far 75 F-35Bs have been delivered to the Marine Corps and United Kingdom. The F-35B will replace the AV-8B Harrier jump jet fighter and F/A-18D Hornet in Marine squadrons. The (kind of) good news is that compared to the plane that crashed, the cost of a replacement will be a bargain. The first F-35Bs cost a whopping $226 million each. The price of the jets has slowly but surely declined, to the point where the latest planes cost “just” $115.5 million a pop. There was one casualty from the crash: the buzz the Royal Navy sought to generate for HMS Queen Elizabeth. The UK had scheduled Big Lizzie’s very first flight tests to begin that day off the East Coast of the United States. Two F-35Bs, one piloted by a Royal Air Force and one by a Royal Navy pilot, touched down on the carrier and then took off utilizing the carrier’s ski ramp, a process the two aircraft will repeat hundreds of times over the next ten weeks. As historic as the event was, every article written about Queen Elizabeth’s impressive debut included at least a paragraph on the Beaufort crash. Bummer.